All last week, sleep eluded Robbie. And Justin. And me. No one in our house slept, unless you count the cats. I don’t know what happened. Robbie would go to bed with great fanfare and gnashing of teeth. I begged. I cajoled. He screamed to use the potty. To watch another “‘sode of Sam” and ‘Ickey Mouse. To take a bath. To wash his hands. And then, finally, he succumbed to his bed. He played quietly for two hours – until we went to bed. When all hell broke loose. There was screaming. Crying. Begging. And I was too tired to argue. Into bed with us he went. In the middle of the night, I asked Justin to move over, forgetting that Robbie was in the bed. Justin tried to put him back in his own bed, which is when we discovered that Robbie had stripped naked in his sleep… Fortunately, he had not wet the bed. 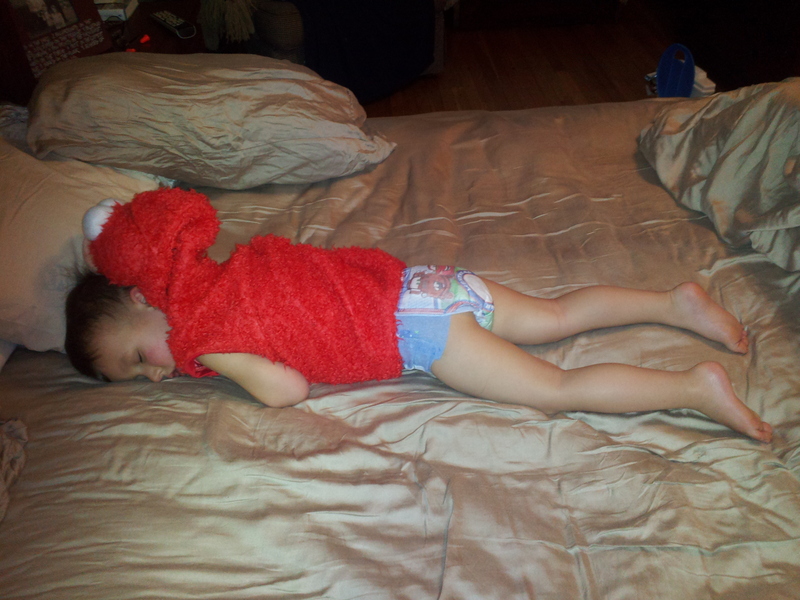 Robbie could only be soothed when we put him in his Elmo suit and a diaper. When Justin put him in bed, Robbie screamed again and again. Finally, exhausted and unable to take any more, I grabbed Robbie from his crib and put him in bed with us. For the second time that night. It looked a little something like this. It wasn’t until the next evening that I discovered why Robbie was so inconsolable. I mentioned that he hadn’t wet our bed. He had, unfortunately, wet his own. It was still soaked the next evening when I went to return all of his toys to the bed. Maybe that’ll teach me to be more understanding in the middle of the night, butI wouldn’t bet on it… Mostly because I know he did the same thing the next night and I wasn’t as patient as I’d promised myself I would be.